The Sparrowhawk, a resident in Britain, is a small, fast-moving member of the falcon family. The male, at typically 30cm long, is some 7cm shorter than the female and has slate grey back and upper wing plumage (the female is more brown-grey). There is usually an almost entirely white spot on the back of the neck. The typical wingspan of a male is 60 to 65cm, while the larger female has a wingspan somewhere between 70 and 80cm. In many respects the Sparrowhawk is similar to a Kestrel but somewhat smaller; however, Kestrels hover and Sparrowhawks do not, so if you see them hunting for food you will know immediately which is which. The call of a Sparrowhawk is a distinctive 'ke-ke-ke-ke'. These predatory birds are resident throughout most of southern and central Europe, including Britain and Ireland. Although not seen very often if at all by most of us, Sparrowhawks are quite common birds of woodland and open country. Sparrowhawks nest in trees or sometimes on cliff ledges. Typically five white eggs, blotched with red-brown, are laid in a flattish nest made from twigs. Owners of racing pigeons have for many years considered the Sparrowhawk a serious menace; however, research evidence does not support the claims that a significant number of pigeons are taken by these little hawks. 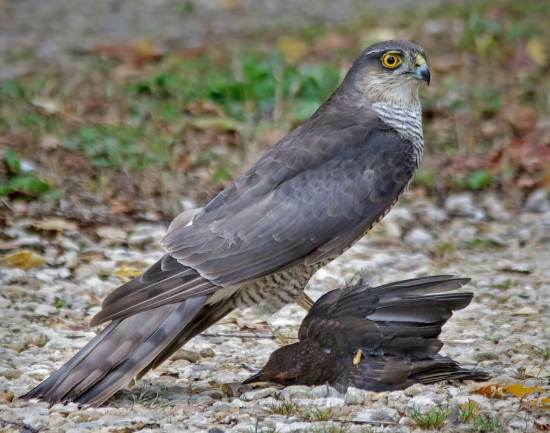 It is ground-feeding birds, particularly, that have greatest difficulty escaping when a Sparrowhawk swoops upon them; we have even seen songbirds seized by a Sparrowhawk while they were eating seeds that we have put out for them, giving a whole new meaning to the term bird table! 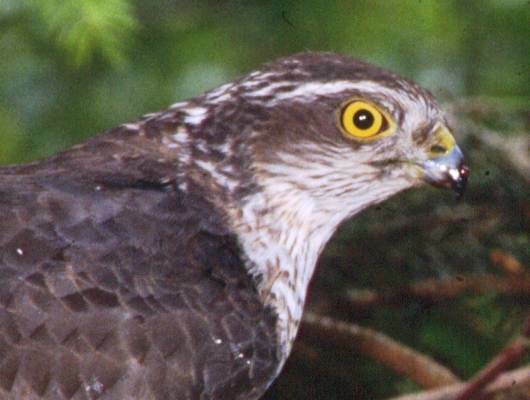 Sparrowhawks consume their prey either on the ground or on a fence post or other stable low platform. They stand upon the victim, spreading their wings and tail; whether this is to gain extra stability as they tug chunks from the carcass or to prevent other birds of prey from seeing that they have achieved a kill is not clear. Although all other birds of prey have been protected by law in Britain since 1954, the sparrowhawk did not receive legal protection until 1961. This and all other birds of prey are now fully protected under the Wildlife and Countryside Act 1981, under which it is an offence to kill, injure or take adult birds or their eggs or destroy anest that is in use. 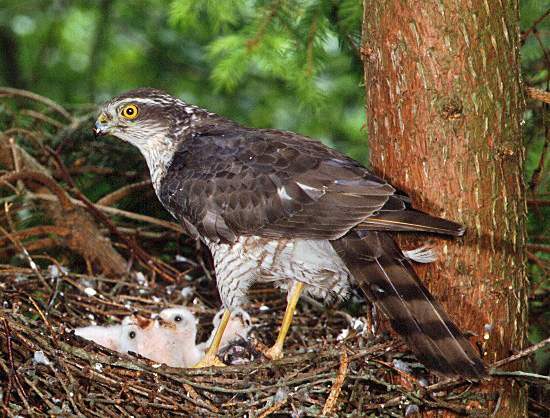 The natural lifespan of a Sparrowhawk is five to seven years; however, few live more than three or four years. The main reason for their death is not predation by larger birds but starvation due to lack of food availability or, all too often in the recent past, prolonged hard winter frosts. This page includes pictures kindly contributed by David Adamson and Melvin Grey.